The Things about Museums constitutes a unique, highly diverse collection of essays unprecedented in existing books in either museum and heritage studies or material culture studies. Taking varied perspectives and presenting a range of case studies, the chapters all address objects in the context of museums, galleries and/or the heritage sector more broadly. 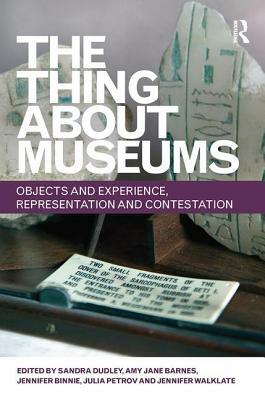 Specifically, the book deals with how objects are constructed in museums, the ways in which visitors may directly experience those objects, how objects are utilised within particular representational strategies and forms, and the challenges and opportunities presented by using objects to communicate difficult and contested matters. Topics and approaches examined in the book are diverse, but include the objectification of natural history specimens and museum registers; materiality, immateriality, transience and absence; subject/object boundaries; sensory, phenomenological perspectives; the museumisation of objects and collections; and the dangers inherent in assuming that objects, interpretation and heritage are 'good' for us. Sandra Dudley is Senior Lecturer in the School of Museum Studies, University of Leicester. Recent books include Materialising Exile: material culture and embodied experience among Karenni refugees in Thailand (Berghahn 2010) and Museum Materialities (ed., Routledge 2010). Amy Jane Barnes has recently completed doctoral research on the collection, interpretation and display of visual culture of the Chinese Cultural Revolution in contemporary British museums (University of Leicester 2009). Jennifer Binnie is currently a PhD student at University of Leicester, looking at the impact which art within museums and galleries may have upon wellbeing. Julia Petrov is a PhD student at the School of Museum Studies, University of Leicester. Her project traces the development of dress exhibitions in museums in England and North America over the twentieth century. Jennifer Walklate is a PhD student in the School of Museum Studies, University of Leicester. Her AHRC funded research explores and compares the production of temporal experiences in museums and works of literature.